Daytona Beach shores is a very well kept secret in Volusia County. With just 5,000 full time residents, this quiet, serene beach front secret extends from Dunlawton Ave to ponce Inlet. 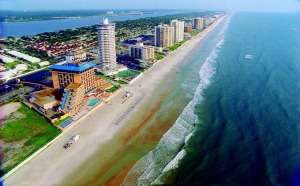 From spectacular beach front homes and several high rise upscale condo choices, the ocean views are just stunning. Volusia Moving & Storage can help you move into any condo, no matter what floor, or any home in Daytona Beach Shores or Ponce Inlet. No job is too large for our professional white glove moving service.